Run 'slui.exe 0x2a 0x80072EFD' to display the error text. Error code 0x80072EFD means: "A connection with the server could not be established". 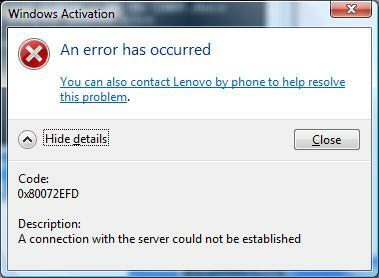 The error message means that slmgr.vbs couldn't connect to the activation server. 1. Make sure the KMS server isn't firewalled by either Windows Firewall or another software firewall program. 2. Make sure the KMS server has a _vlmcs._tcp.domain.whatever SRV record. 3. Make sure no other server has a _vlmcs._tcp.domain.whatever SRV record.